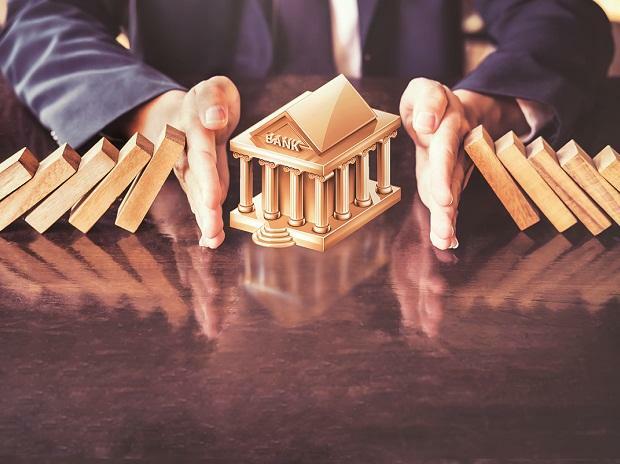 Banking: Where do we go from here? Around Rs 3.5 trillion or 3.9 percent of the stressed corporate loans continue to remain unrecognised on the books of banks and nearly 40 percent of them may become dud assets by September 2020, warns a report. These accounts are part of the total stressed corporate exposure (interest coverage ratio of 1.5x) of 19.3 percent or Rs 13.5-14 lakh crore as of September 2018. "Around 3.9 percent of the stressed corporate exposure of 19.3 percent total stressed corporate accounts are still unrecognised and are standard in banks' books, while around Rs 1.5-2 lakh crore of them may slip into NPAs by H2 of FY20," Jindal Haria, associate director for banking and financial institutions at India Ratings told reporters Tuesday. Of the Rs 13.5-14 trillion stressed corporate loans, banks have recognised only Rs 10 trillion as of September 2018, he added. Jindal said banks may need an additional f Rs 40,000 crore in provisions for these Rs 1.5-2 trillion loans, which may slip into NPAs. Meanwhile, the agency has maintained a stable outlook on large private sector banks and just two of the 19--State Bank of India and Bank of Baroda-and has retained a negative outlook for the remaining state-run banks till FY20. In FY20, all banks on which we have a stable outlook might see moderate write-backs of provisions on corporate assets, depending on the pace of resolutions, it said. The top 40 assets under the NCLT resolution regime are worth Rs 4.50 trillion for which banks have made provisions for 70-75 percent, the agency said in a report. Over FY19 and FY20, credit cost from stressed corporate assets will depend on ageing/resolution/ liquidation, if any, the report said, adding the cap on credit cost shall be established by ageing and will be around 4.4 percent, spread over FY19 and FY20. The agency estimates the quantum of government capital infusion (Rs 1.94 trillion) in FY18 and FY19 to be around 33 percent of the state-run banks' equity base as of the first half of FY19. "This would largely cover the provisioning cost, especially on stressed corporate loans and meet the minimum Basel III requirements by March 2020," it said. The agency expects state-run banks would require incremental capital of about Rs 66,000 crore from the fourth quarter of FY19 through FY20, which is needed for a credit expansion of 10-11 percent in FY19 and FY20 each. This capital infusion, however, is not adequate to cover the impact of Ind-AS which could be substantial, the agency said in the report. As per the report, in the absence of Ind-AS, the credit cost of some state-run banks can be lower than their pre-provisioning operating profit due to ageing and fresh slippages, and these banks can report profit in FY20. In FY20, competition for deposits will intensify, as borrowings remains high, while system deposit growth remains muted at 6 percent. In a separate report, the agency said it expects NBFCs to witness margin pressures in FY20. The sector will register a tepid growth in FY20 due to slower traction in segments such as auto and real estate. The performance of collateral-backed MSME loans would continue to deteriorate, leading to the outlook for the segment being revised to negative from stable-to-negative. "Lenders' over-reliance on collateral comfort rather than business cash flows of prospective borrowers, which had been stretched during demonetization and formalisation of income post-GST rollout, has led to the current spate of continuing defaults," it said. For tractor loans, the agency does not anticipate any further improvement in delinquencies in the near term, as the borrowers continue to grapple with less-than-normal monsoons and falling farm goods prices, as evident from lower food inflation.